DISCUSS THE MATCH Ghana suffered a surprise 1-0 reversal in their opening match of the group phase of the FIFA World Cup African zone qualifiers at hands of Burkina Faso on Saturday. The entry into the game of substitute Mamadou Zongo led to the game's only goal on 80 minutes when he met a cross from Florent Rouamba. It marked a successful return to the side for Zongo after a long injury lay-off for the striker from Dutch club Vitesse Arnhem. 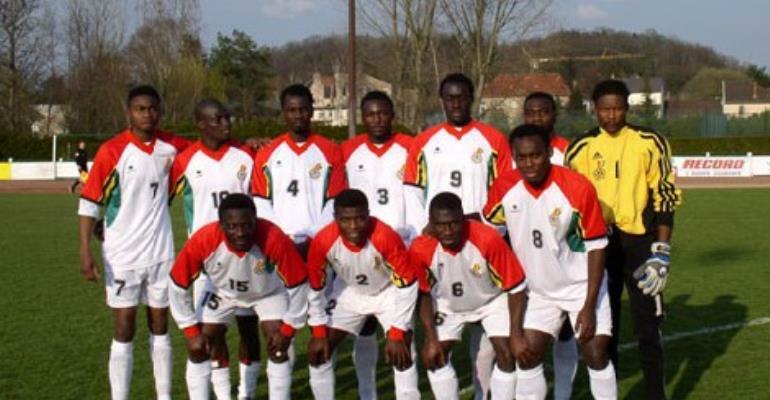 Ghana held the early initiative and hit the crossbar through Italian-based defender John Mensah on 13 minutes. But Burkina Faso, playing their first competitive match since their disappointing outing at the African Nations Cup finals earlier this year, also threatened in the first half, notably through French-based striker Moumouni Dagano. He proved a difficult customer for Ghana throughout the game and only Ghana's midfielder Stephen Appiah matched him for dominance in the game. Ghana's defender Samuel Osei Kuffour, who plays for Bayern Munich, was taken to hospital for examination of a shoulder injury suffered near the end of the match. Black Stars Line-up: gk Richard Kingston, Addoquaye Pappoe, Amankwah Mireku, John Mensah, Sammy Osei Kuffour, Michael Essien, Stephen Appiah, Derek Boateng/Ablade Morgan, Sulley Muntari/ Emmanuel Duah, Anthonhy Obodai, Lawrence Adjei/Nana Arhin Duah. Coach – Mariano Barreto Ghana's next game is at home against South Africa on June 28.